This is Zoey and a radiograph of her abdomen. Zoey was recently seen for inappropriate urination. During her exam a pea-sized stone in the bladder was palpated. 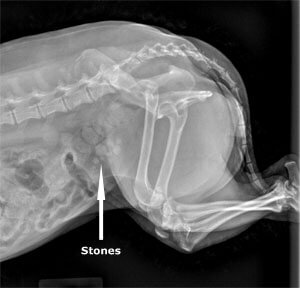 Radiographs were ordered and confirmed the presence of bladder stones. A urinalysis was performed which revealed an infection with evidence of crystals consistent with a struvite bladder stone. Struvite bladder stones often form secondary to a bladder infection. They are however uniquely able to be dissolved with medication therapy. 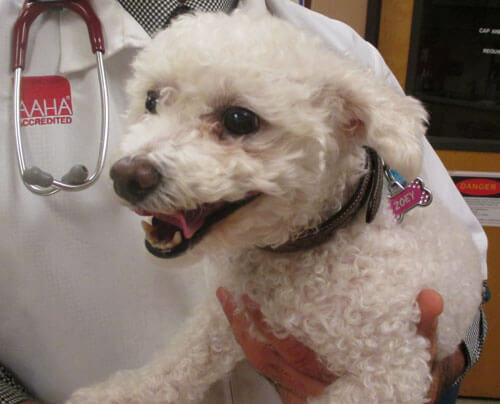 Zoey was placed on and oral antibiotic as well as a special urinary diet and within 6 weeks the bladder stones were gone. She is doing well and will maintain her urinary diet to prevent future problems. Congratulations Zoey on being the first Pet of the Month for 2014.